An original Apple-1 computer sold at auction for more than $200,000 on Tuesday. (CNN) -- One of Apple's first computers has sold for more than $200,000. Perhaps the buyer didn't hear about Apple's online sale on Friday? The Apple-1 computer -- among the first made in a garage by Apple co-founders Steve Jobs and Steve Wozniak -- sold for about $213,600 at a Christie's auction held in London, England, on Tuesday, according to the company's website. A private collector named Marco Boglione purchased the machine, according to the Associated Press. 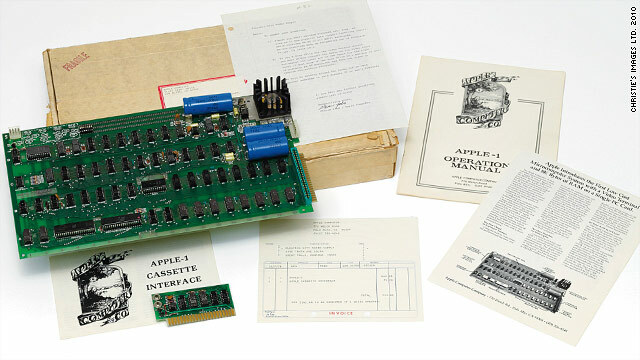 The Apple-1 computer came with a typed note from Jobs as well as a box stamped with the company's original logo -- an apple falling on Sir Isaac Newton. The computer originally sold for $666.66. The Apple-1 holds a place in tech history because it was easy enough for anyone to use (i.e., users didn't have to weld the motherboard together, as was the case with previous "home" computers, according to Christie's). It helped popularize at-home computing and led to the computer revolution. Jobs and Wozniak built the Apple-1 starting in 1976. Since then, the company has become one of the hottest producers of computers and gadgets on the market , with flagship products like the iPhone, iPad and iPod. People at the auction in London used some of these devices to document the Apple-1's sale, the Associated Press story notes. The AP also reported that Wozniak attended Tuesday's auction and added his own signed letter to the winning lot. Christie's had estimated the Apple-1 would sell for $160,000 to $240,000, and a Christie's spokesman told the Wall Street Journal's "Tech Europe" blog that the $213,000 sale price is a new record for any personal computer at auction. About 200 Apple-1 computers were produced, and they fetched substantially lower prices at earlier auctions. "Despite its incredible rarity, the Apple-1 has previously been known to fetch at best $50,000 at auction, and typically garners more like $14,000 to $16,000."